“Mom, there’s a kid in my class named Doodle,” Victoria explained as she downed a glass of milk right before dinner last night. “How tragic. Is his mother a comedian?” I asked. “It’s a her, and it’s a nickname,” came the exasperated response. “It’s a she,” I corrected in my best grammar-snob tone. When I was nine my grandparents (more likely my grandmother, conveniently and “innocently” without permission from my grandfather, but I’m speculating here) bought me four tiny, adorable yellow ducks for Easter. I loved them. I do not recall all four names, but I do recall naming two of them Donald and Duckie. “Duckie, Mom? Really?” Vic interrupted during my verbal retelling of the story. It was my turn to give her The Look. 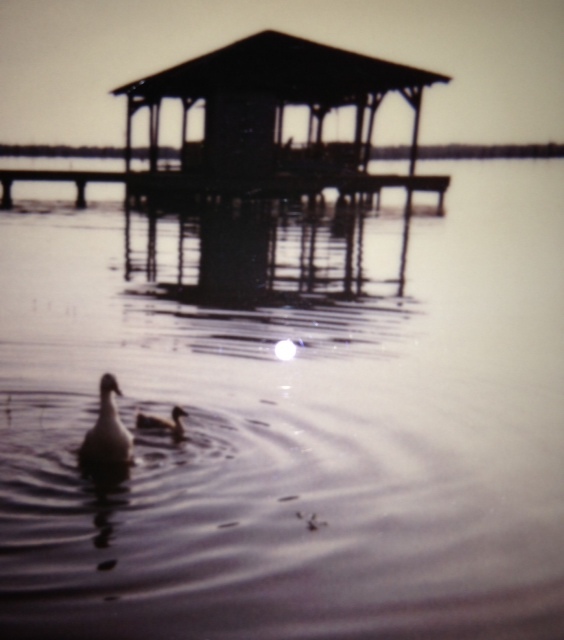 My four ducks would live in my grandparents’ back yard on the lake where I could come visit them on weekends. I had my own tree house in the back yard, and the adults fastened chicken wire around the support posts of the tree house so the ducks could play and roam the ground underneath. They were so cuuuuuuute!! 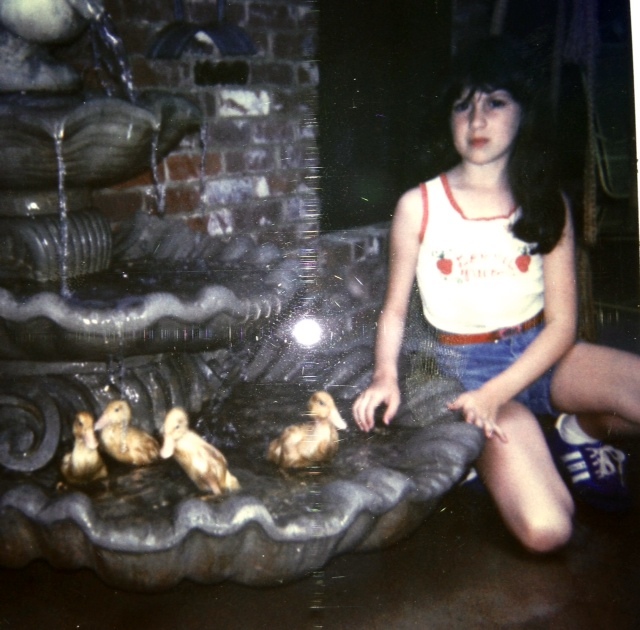 Posing with the Four D’s at my grandmother’s patio fountain. Wasn’t I a fashion plate? But cute met a tragic end one night during a dog attack. My grandmother says it was the next-door neighbor’s dog, although Mom and I remember blaming the Mafia dogs. Yes, Mafia. Scary people at the top of the hill who had two guard booths in the front yard, six black Rolls Royces in the driveway and twelve massive St. Bernards running the property. TWELVE SAINT BERNARDS. Now, I’m all about large-breed dogs, and my favorite critters on earth are those who have to grow into their oversized paws and ears, but C’MON!!! Whatever dog(s) came for the attack, they busted through the chicken wire with little effort. And maybe if it had been a dozen dogs, no duck would have escaped. Still, we blamed the pack. The next morning, there was nothing but feathers…and Duckie. Miraculously, he had survived the attack. I don’t recall his injuries, as I’m sure he suffered a few. My grandmother was so upset that three-quarters of my Easter present had been eaten that she promptly bought me four more ducklings. They grew fast, and Duckie grew too. His yellow fluff gave way to pristine white feathers and he stood above the crowd as he honked orders at his tiny charges. Easter having passed and the pet shop’s supply of cuteness obviously dwindling, the newbies were not all yellow. One was a motley mix of varying shades of grey and brown. He looked like someone had taken a pen and doodled all over him. So Doodle he became. Again, I don’t recall the other ducks’ names. And again, the dog(s) came calling. True, my thirty-year old memories may deceive me. 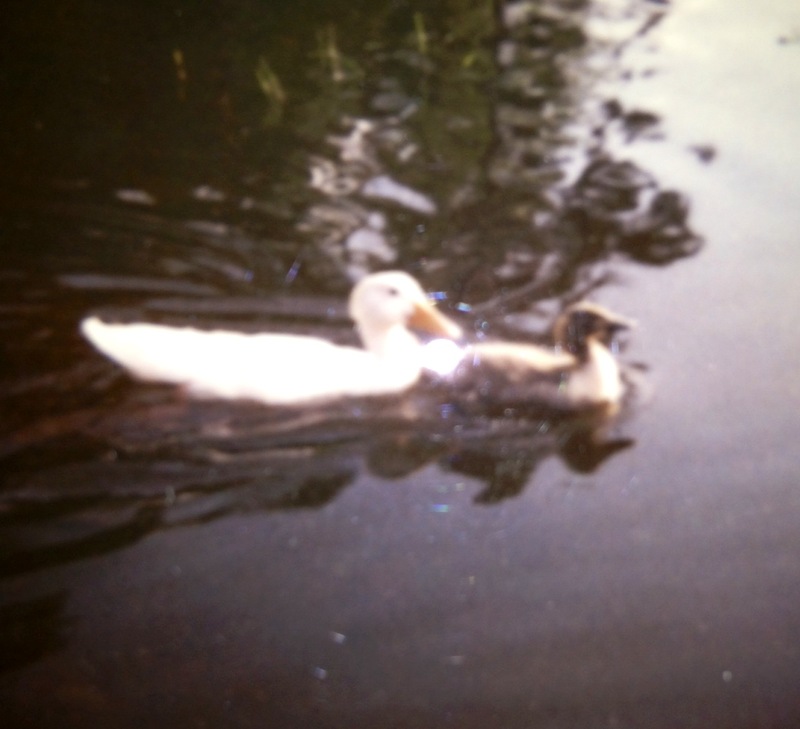 I have photos of Duckie and Doodle swimming in the lake water together, but no other ducks. So I’m not sure if three of the second batch met a tragic end, meaning Duckie and Doodle would have survived a second attack. Or if my memories and photos of Doodle and Duckie together conveniently omit the other three ducks as easily as they omit their names. The “cage” had been fortified after the first attack, but it wasn’t enough. We must have been visiting during the final attack, or else my grandmother was very graphic in describing the scene, because I have an image burned in my mind of Duckie’s white feathers covering almost every inch of the area underneath the tree house and trailing through my grandmother’s yard. Duckie was gone and Doodle was just barely alive. Doodle’s back had been ripped apart, exposing meat and crawling with maggots and infection. My grandmother kept him protected and doctored him every single day until all the nastiness of rotting flesh was banished for good and his wounds healed. She took him down to the water’s edge where he hid beneath the foliage of her green bean garden. She fed him every day and nursed him back to health. Often, a paddling of ducks would swim by and quack at Doodle. Sometimes he would quack back. One day, he just swam away with them. Doodle would come back to visit periodically, either to beg for bread crumbs or just say hi to the old homestead. My grandmother says he waddled with a slight limp, so she always knew it was him. Over the next few years I would stand on my grandmother’s dock whenever I heard ducks and I would spy Doodle swimming across the lake with his new family. He was fairly easy to spot among the pretty Mallards with his odd markings and plain brown head. He was happy, he was healthy and he was free. “Aww, Mom. I want some baby ducks,” Victoria pleaded when my story was finished. I smiled at my daughter and slipped a sideways glance at our feisty Labrador, Mabel.